Integration with The Booking Button allows site visitors to make instant short term accommodation bookings. 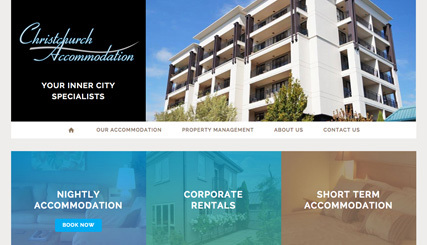 We also work with Christchurch Accommodaton on the Online Marketing of their website. When we decided to update our prehistoric website Limelight Online came recommended and we have since recommended to others. Limelight Online have done an excellent job designing a mobile-friendly website for us and they continue to manage our digital marketing campaign with great success. The content management system is incredibly easy to use and allows us to make our own changes to content at any time. The product Limelight Online delivered was beyond our expectations. Thank you to all the staff at Limelight Online and needless to say I highly recommend them.